Religion, particularly Christianity, has played an outsize role in African American history. While most Africans brought to the New World to be slaves were not Christians when they arrived, many of them and their descendants embraced Christianity, finding comfort in the Biblical message of spiritual equality and deliverance. In post-Civil War America, a burgeoning black church played a key role strengthening African American communities and in providing key support to the civil rights movement. For Black History Month, here are five facts about the religious lives of African Americans. 1Roughly eight-in-ten (79%) African Americans self-identify as Christian, as do seven-in-ten whites and 77% of Latinos, according to Pew Research Center’s 2014 Religious Landscape Study. Most black Christians and about half of all African Americans (53%) are associated with historically black Protestant churches, according to the study. 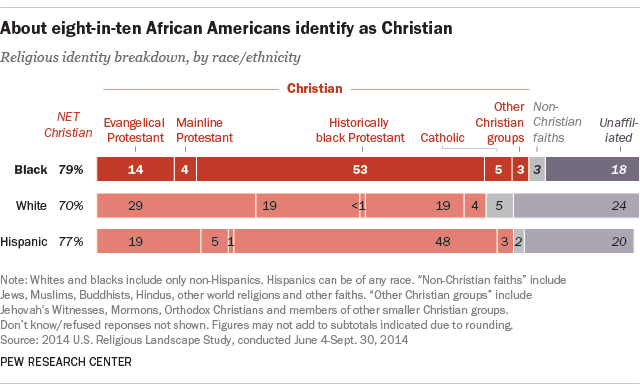 Smaller shares of African Americans identify with evangelical Protestantism (14%), Catholicism (5%), mainline Protestantism (4%) and Islam (2%). 2The first predominantly black denominations in the U.S. were founded in the late 18th century, some by free black people. 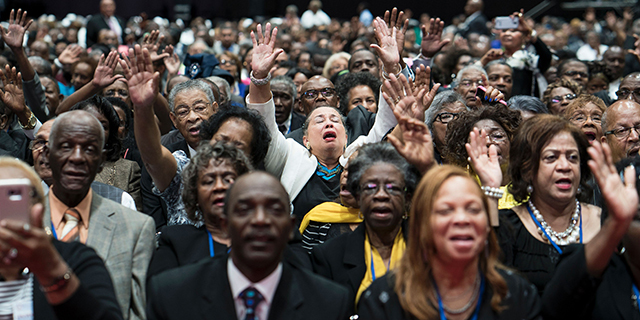 Today, the largest historically black church in the U.S. is the National Baptist Convention U.S.A. Inc. Other large historically black churches include the Church of God in Christ, the African Methodist Episcopal Church (AME), and two other Baptist churches – the National Baptist Convention of America and the Progressive National Baptist Association Inc.
3 African Americans are more religious than whites and Latinos by many measures of religious commitment. 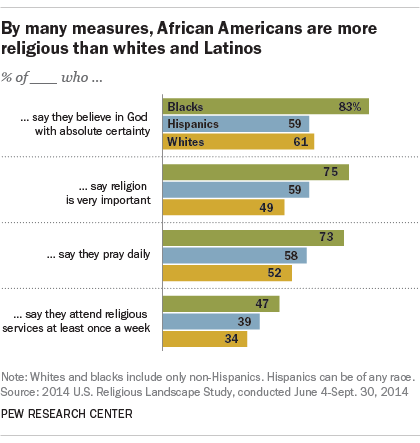 For instance, three-quarters of black Americans say religion is very important in their lives, compared with smaller shares of whites (49%) and Hispanics (59%); African Americans also are more likely to attend services at least once a week and to pray regularly. Black Americans (83%) are more likely to say they believe in God with absolute certainty than whites (61%) and Latinos (59%). 4The share of African Americans who identify as religiously unaffiliated has increased in recent years, mirroring national trends. In 2007, when the first Religious Landscape Study was conducted, only 12% of black Americans said they were religiously unaffiliated — that is, atheist, agnostic or “nothing in particular.” By the time the 2014 Landscape Study was conducted, that number had grown to 18%. As with the general population, younger African American adults are more likely than older African Americans to be unaffiliated. Three-in-ten (29%) African Americans between the ages of 18 and 29 say they are unaffiliated compared with only 7% of black adults 65 and older who say this.